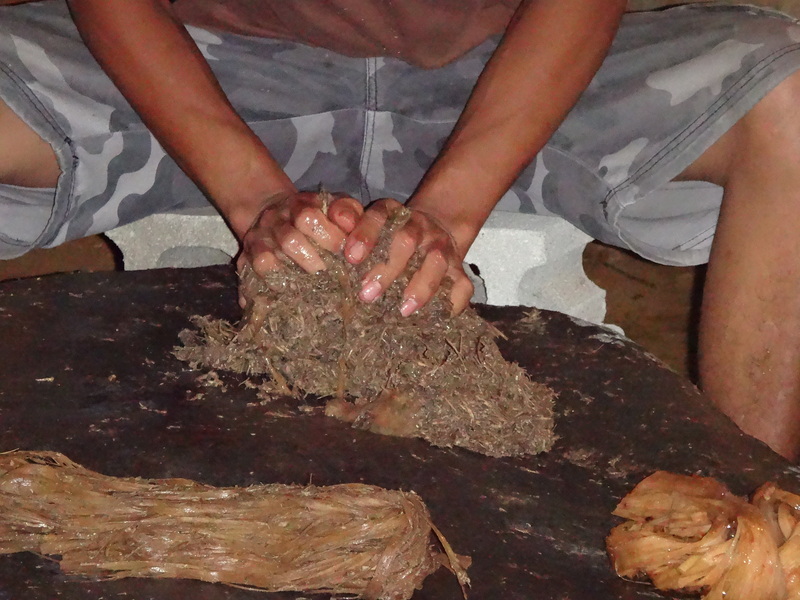 Sakau is an herb drink that is harvested from a shrub, Kava or Piper Methysticum, which grows in the South Sea islands. The drink has a numbing and relaxing effect on the body and is commonly used throughout the week in place of alcohol, but, traditionally used to celebrate special occasions. 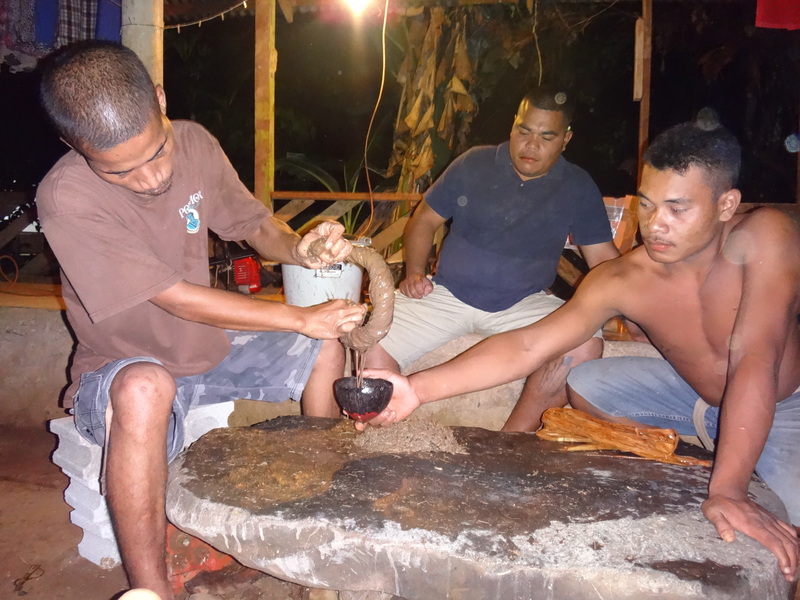 Kava originated in the Kosrae state of Micronesia. 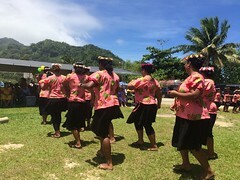 One version of the oral history says the plant was brought to the main island by a Kosrean woman who carried the Kava seeds in her “downstairs” to avoid agriculture inspection when she arrived at her destination of Pohnpei. Sakau in Kosrae is odorless while Sakau in Pohnpei has a strong oder, for the reason stated in the previous sentence. Therefore, when you drink Sakau in Phonpei, it has become tradition to close your eyes when you take a sip in order to prevent the smell from burning your eyes. Instructions as told by my friend Mason, a local 12th grade student in Pohnpei. Drive to up the mountains, ( 1-2 hour drive), Park car/truck below the mountain. 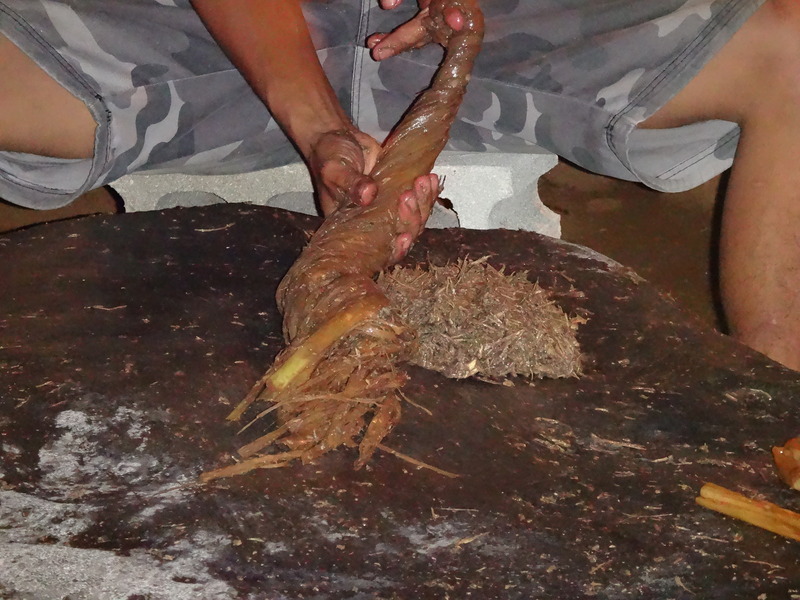 Then hike up mountain and look for the kava plants that have the oldest branches. When you locate them begin digging up the roots, which will come up easily when using a shovel. Step 2: Carry Sakau branches from the site to the car. The Sakau is extremely heavy, each person carries one Sakau plant. With 5-10 people carrying the sakau plants only one trip up and down the mountain is needed. Step 3: Drive home with Sakau plants in the trunk. Step 4: Arrive at home and unload Sakau plants near the nahs. Begin washing the dirt from the roots, it is important to insure that it is thoroughly cleaned. Then, take a machete and cut off the branches leaving only the roots. 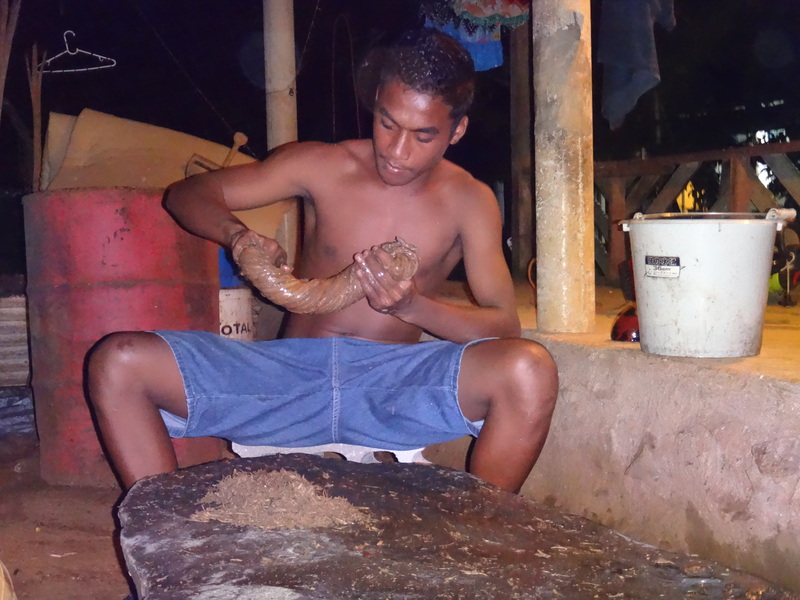 Step 5: Wash the traditional pounding stone then put washed roots onto the stone. 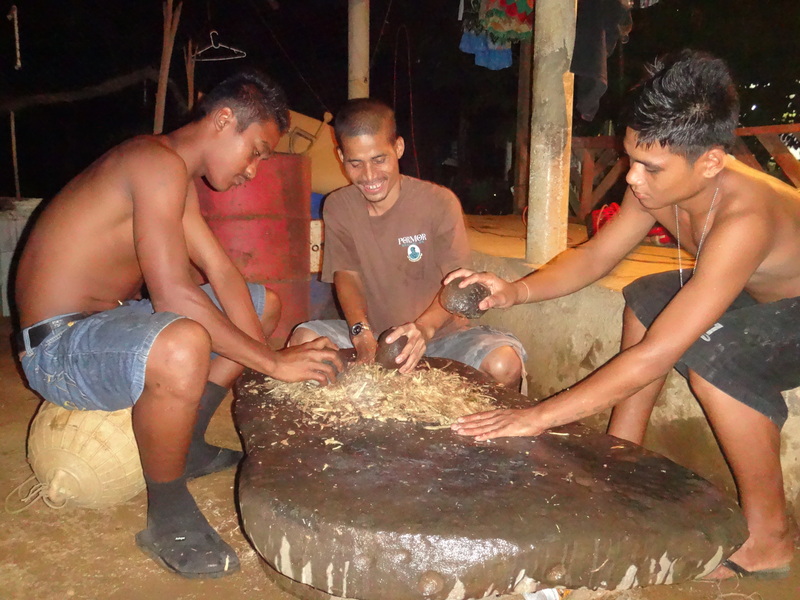 Step 6: Two-four of the men take a sphere shaped pounding rock and then begin to pound the Sakau roots on the stone in order to break up the roots into smaller pieces. 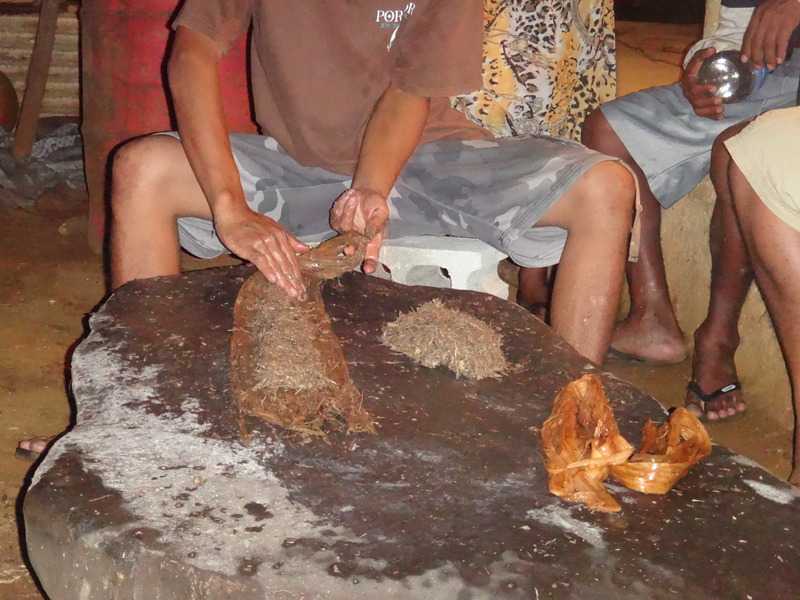 Step 7: Take the hibiscus bark and use the machete and shave off a long strip. Step 8: As the roots are being pounded begin adding water in the amount of a half coconut shell to the crushed Sakau roots. Step 9: Begin using hands to kneed the water and Sakau mixture together. Step 10: Lie the hibiscus strip flat on the pounding stone and place Sakau root mixture evenly inside. 11: Twist up the hibiscus while your partner holds the coconut cup underneath the hibiscus strip, as you twist the Sakau drink will leak from the hibiscus into the cup. …And remember when in Phonpei close your eyes when you drink Sakau in order to prevent your eyes from burning. So, about that waterfall in my last post…. A few days later, we had a class session with USDA Natural Resources and Conservation Services Staff Member Arlene Rosenkrans, she taught us about Leptospirosis in the area. Leptospirosis is a disease carried from animal urine through water that affects humans with flu-like symptoms. In Micronesia, piggeries are commonly located near riversides where the animals’ urine and feces contaminate passing by water. The USDA Natural Resources and Conservation Services estimate more than 3,000 piggeries in Phonpei. Just up stream of the Kepirohi Waterfall are multiple piggeries, allowing the location to have one of the highest numbers of leptospirosis contamination in the state of Phonpei, said Rosenkrans in our class session. In hindsight, we are all grateful that our water safety training was the week after our visit, which prohibited us from cooling down underneath the waterfall. Thank God. Click here to find out more about the environmental impact piggeries have in Phonpei. I’m thrilled to inform you that I have recently accepted an invitation to teach english as a second language in the Federated States of Micronesia with the Peace Corps. I applied for this opportunity in June 2014, just after graduating with my BA in journalism from San Francisco State University, and completing a TEFL (teach english as a foreign language) certificate program. Six months later, December 2014, I was interviewed and offered a to fill 1 of 40 teacher positions in Micronesia. It was hard to make the decision to move to a different country, but after much thought and conversations with those close to me I knew this experience had greater pros than cons. With this experience I have the opportunity to travel the world and build a greater understanding of the word diversity. I will teach English, which will keep my editing skills sharp. I will write about my experience and analyze the culture of my new home; all of this will be shared through photos, videos and text to be featured on this site. My departure date is June 2015 and I will return to the United States in 2017.